Direct3D 10.1 is an incremental update of Direct3D 10.0 which is shipped with, and requires, Windows Vista Service Pack 1. This release mainly sets a few more image quality standards for graphics vendors, while giving developers more control over image quality. It also adds support for parallel cube mapping and requires that the video card supports Shader Model 4.1 or higher and 32-bit floating-point operations. Direct3D 10.1 still fully supports Direct3D 10 hardware, but in order to utilize all of the new features, updated hardware is required. As of November 29, 2008, only ATI's HD4000 and HD3000 series and S3's chrome 4xx GTX series of GPUs are fully compliant, Nvidia has yet to release a DX10.1 compliant card. All future DX11 hardware will also support DX10.1 in order to be DX11 compliant. Microsoft DirectX is a collection of application programming interfaces (APIs) for handling tasks related to multimedia, especially game programming and video, on Microsoft platforms. Originally, the names of these APIs all began with Direct, such as Direct3D, DirectDraw, DirectMusic, DirectPlay, DirectSound, and so forth. DirectX, then, was the generic term for all of these APIs and became the name of the collection. After the introduction of the Xbox, Microsoft has also released multiplatform game development APIs such as XInput, which are designed to supplement or replace individual DirectX components. Direct3D (the 3D graphics API within DirectX) is widely used in the development of video games for Microsoft Windows, Microsoft Xbox, and Microsoft Xbox 360. Direct3D is also used by other software applications for visualization and graphics tasks such as CAD/CAM engineering. 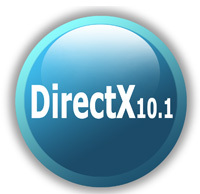 As Direct3D is the most widely publicized component of DirectX, it is common to see the names "DirectX" and "Direct3D" used interchangeably. The DirectX software development kit (SDK) consists of runtime libraries in redistributable binary form, along with accompanying documentation and headers for use in coding. Originally, the runtimes were only installed by games or explicitly by the user. Windows 95 did not launch with DirectX, but DirectX was included with Windows 95 OEM Service Release 2. Windows 98 and Windows NT 4.0 both shipped with DirectX, as has every version of Windows released since. The SDK is available as a free download. While the runtimes are proprietary, closed-source software, source code is provided for most of the SDK samples.